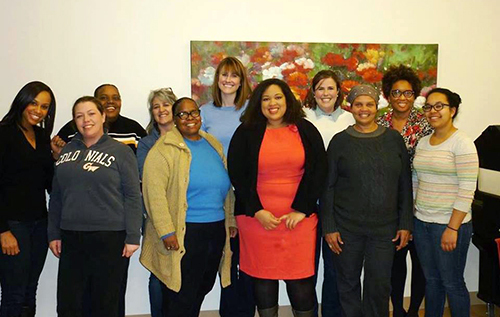 Book club participants got a visit last spring from author Danielle Evans (shown at center). We’re happy to announce that after a summer hiatus the Calvary book club got back to reading a few weeks ago! Every other Sunday, Junior League volunteers meet with women at Calvary to discuss the current book. The PEN/Faulkner Foundation provides books for women and even arranges for the author to visit for certain books. The book club at Calvary brings together women from different walks of life and gives us a common purpose. We all come from different experiences but the books we read unite us in a passion for reading. Our discussions in book club show us how alike we are and remind us of our common experiences as women. Books serve as the common ground through which we share, learn and form friendships. This fall we are focusing on short stories, followed by a novel in January and poetry in the spring. Currently we are reading Before You Suffocate Your Own Fool Self by Danielle Evans. The collection of short stories has been well-received and has sparked great discussion about growing up, motherhood, race and family. Danielle Evans visited Calvary last spring and gave us all great insight into her process and world views. The engagement and enthusiasm of everyone in the room is apparent during book club meetings. Book club encourages women in the process of changing their lives to adopt a healthy habit for life and inspires us all (whether living at Calvary or not) to read more. We look forward to many more books and many more great discussions at Calvary!